EATON — The Preble County Historical Society, for a brief moment in time, turned back the calendar to 1903. Greg Arnett, past president of PCHS, fired up the society’s own first production Model A, still sporting its red paint job, and drove it around the grassy ground at the historical center after a short presentation on Tuesday, July 7. It was the second time the Model A had been started since the PCHS received it from Harvey Greeting, a Ford dealer in West Manchester, in 1978. The first time the center started the car was in 2011. “We had put so much effort in the restoration of the car but nobody had actually got the car running. So (former board member) Harold Bussell and his wife Jean asked why we didn’t have this thing running,” said Arnett. Bussell said they took the automobile over to Bill Marshall in New Paris, who is known for working on old cars. Marshall had worked on Model T’s before but never a Model A. “I think the biggest problem (Marshall) ran into was the carburetor. Once he got the carburetor adjusted we finally got it fired up and drove it back in 2011 back in New Paris,” said Arnett. But the car sat for four more years after that, until new president Tim Lane entered the picture. The Model A was restored by Thurman Schreel, Tom Unger, Andrew Coffman, and Jim Mitchell – with help from the “Over the Hill Gang” automobile club in 1982. It was then refurbished in 2003 by the Dayton Buckeye “Model A” Ford Association before the PCHS took it to Mitchell in 2011. The car was built in 1903 in Detroit, Michigan in a building that measured 250 feet by 50 feet. Over the course of the year, 1,750 Model A’s were produced before being replaced by the Model C. Out of the 1,750, only 56 are known to still be in existence. Out of those 56, the PCHS was unable to find another one running. In its time, the biggest selling point for the vehicle was its engine – which is a two cylinder engine with eight horsepower. It was advertised to reach speeds at 30 miles per hour (but, in reality, ran at a top speed between 25 and 28 MPH). “It’s a gem to us here in Preble County,” said Arnett. 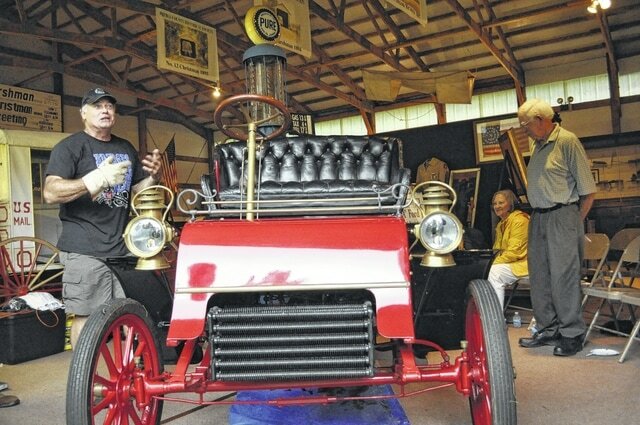 Greg Arnett demonstrates how to start the 1903 Model A in a garage at the Preble County Historical Society on Tuesday, July 7.
http://aimmedianetwork.com/wp-content/uploads/sites/41/2015/07/web1__DSC0720.jpgGreg Arnett demonstrates how to start the 1903 Model A in a garage at the Preble County Historical Society on Tuesday, July 7.